Hey Hanz, Do You Think It'll Fit? The General Electric GAU-8/A Avenger is a 30 mm, hydraulically-driven seven-barrel Gatling-type rotary cannon that's mounted on the A-10 Thunderbolt II. 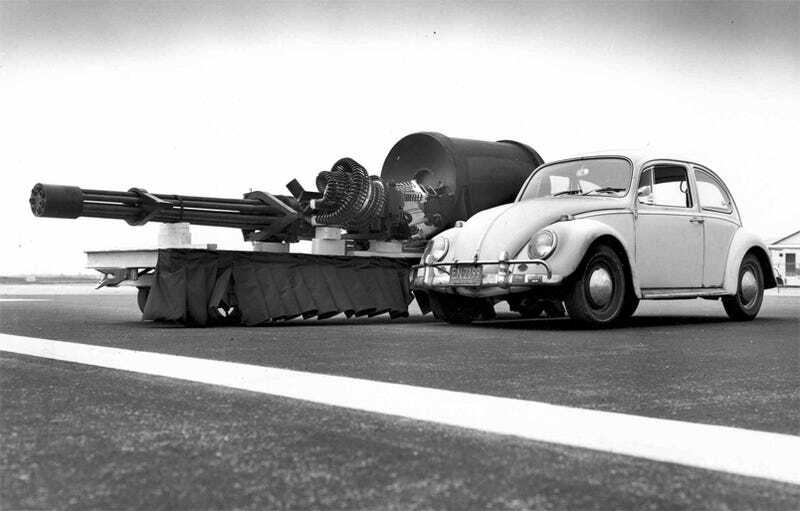 So what the heck is it doing next to a Type 1 Beetle? A pretty common urban legend about the GAU-8/A Avenger is that the recoil force matches the thrust of the A-10's General Electric TF34-GE-100 turbofan engines causing the plane to slow down, stall and subsequently crash if the gun were fired for a prolonged period of time. It's even been claimed that the plane would begin to fly backwards, but that's silly since we all know that only UFOs can do that...duh! The actual recoil force of the GAU-8/A Avenger is 10,000 pounds-force, equivalent to 45 kN, which is much less than the maximum 82.6 kN combined thrust of the TF34-GE-100 turbofan engines. Consider this myth busted.